PARIS — So what has become of this France, champion of maintaining order, exporter of its savoir-faire and its materials to other democracies — and to totalitarian regimes anxious to quell burgeoning opposition movements? Just a few years ago, a spokesman for French tear gas manufacturer Alsetex, which supplies to the French police, told Le Monde, "our tear gas formula is the purest in the world, which allows people to be taken before the judge in a good state; our grenade is the marque of ‘French democracy.'" But France has gotten in the habit of seeing, each Saturday, the faces and bodies damaged in clashes between law enforcement and the Gilets Jaunes ("Yellow Vests"). The use of excessive force from the latter have put both police and protesters in hospital. But the growing acts of violence attributed to security forces also drive us to question the capacity of the state to totally master the use of democratic force, of which the rules seem to fluctuate. Since the beginning of the crisis, the public powers have, effectively, revealed a completely relative culture of the theory of usage of public force. First of all: the unpreparedness, bordering on naivety, of the reaction to the first protests highlighted that if there had been a theory, it was based on an old model from 1968. Since these events, popular opinion rests on the principal of a officially declared and approved protest, which begin in the early afternoon and finishes with a few skirmishes at the end of the day, before nightfall. With the yellow vest movement, according to the public prosecutor's office of Paris, protests have appeared that are neither declared nor limited, beginning early in the day, with many who have come from the provinces without knowledge of Paris who find themselves infiltrated by groups of very mobile hooligans — or casseurs, "breakers," — sometimes with ties to the extreme right. These limits of the state's ability to properly respond appeared for all to see on December 6, 2018, near a high school in Mantes-la-Jolie (Yvelines), as dozens of youths between the age of 12 and 21 were forced by the police to kneel, in rows, on the ground, with their hands behind their heads. The image shocked the country: brutal security methods from theaters of war suddenly land inside France's borders. In Afghanistan, Iraq, or Syria, the French or American armies treat their prisoners like this, to show their superiority and claim victory. It makes them adopt a position toward the defeated that aims not only to immobilize the adversary but also to symbolize their defeat with a form of humiliation. Through this image alone, this Parisian suburb was transformed to a place where pre-existing codes prevailed outside mere clashes between police officers and rioters. Civil power possesses its own codes: It doesn't look to eliminate the enemy, it aims to neutralize it, to restrain it, to block it. It still allows it an exit route so that it can be dispersed. It anticipates, flexing its muscles for the sole purpose of dissuasion. It doesn't treat violence as such, it knows how to distinguish the different forms of threats, of the small, rebellious groups organized into a grand mass of angry citizens. It needs to know how to overcome and modulate strength. It doesn't treat a protester as an enemy to fight, but as a citizen that it must constrain, and one who has rights. This crossroads of democratic and martial authority drove, on December 1, 2018, the national secretary of the Alliance Police Nationale union, Stanislas Gaudon, to ask the army for reinforcements in the face of the yellow vests, as if civil power could not alone manage the threat without the involvement of the military. Technically, the latter have no more of an answer than the police, but they reassure them. Terrorism has brought us in that direction. The militarization of spirits on national soil has gained traction. Nevertheless, the shift in understanding is heavy with meaning. The soldiers do not know the penal code, which is ultimate the guardian of our democratic society. Terrorism has brought us in that direction. 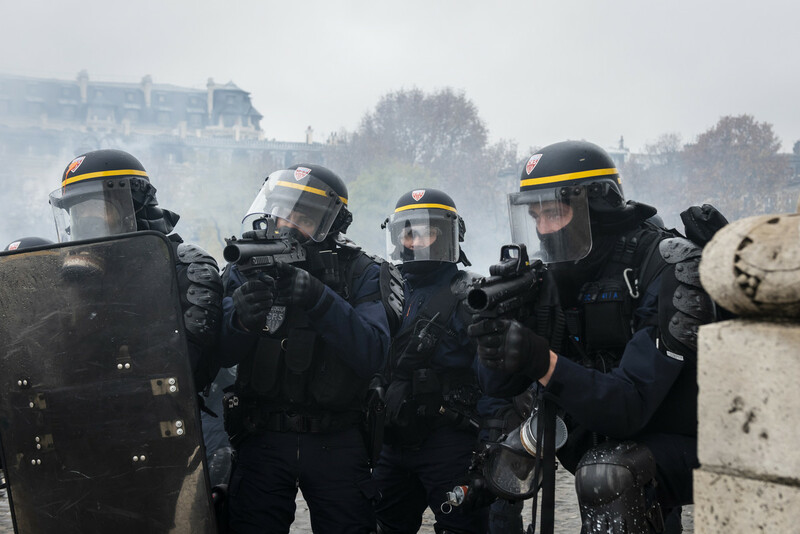 On January 15, the director of the national police, Erik Morvan, split with a reminder of the rules, but for "non-lethal weapons," LBD40, known by the name "flash ball," the origin of grave wounds among the protestors. Pierre Joxe, Minister of the Interior under the presidency of Francois Mitterand, had questioned the disproportionate use of these techniques to maintain order: "With Tasers and the flash-balls, there have been deaths in numerous countries. Why? Because a Taser is not deadly, except when it kills. Who does it kill? Someone with a fragile heart, with health problems. The flash-ball is not deadly, except when it kills. When does it kill? When it bashes in a skull." Lacking a solid position on the use of force, political power faces the risk of allowing practices to drift toward private vengeance. The case of the police commissioner, in Toulon, who meted out justice himself on the grounds that he had been attacked earlier in the same day by yellow vests, was the public expression of this decline in inhibitions that we cannot contain without the firm and appropriate use of democratic force.